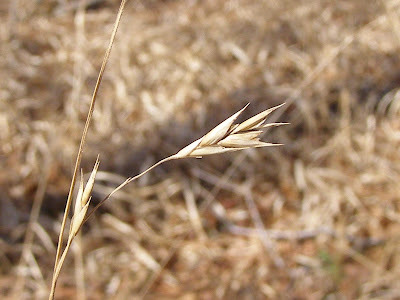 When you think of woodland plants, grasses are generally not the image that comes to mind. There are some grasses, however, that thrive in wooded areas. One common woodland grass at Blue Jay Barrens is Diarrhena Grass, Diarrhena americana. Habitat descriptions for this species suggest it will be found in moist woods. Apparently it also does well in dry woods. The areas of the woods containing Diarrhena had periods in their history when the canopy was much more open. Perhaps additional sunlight helps this grass become established in new areas. Most of the Diarrhena is now growing beneath a near 100% canopy and appears to be thriving. There must be some limiting factor at work here or the Diarrhena would carpet the entire woodland floor. Diarrhena Grass can reach a height of three feet and produce some fairly thick stands, but the individual stalks are not so tightly massed that other woodland plants are excluded from the area. Several species of woodland wildflowers will bloom here in the spring. I think this grass would be excellent for use in restoration of heavily eroding woodland areas. Even a thin stand tends to capture and hold fallen leaves. This keeps the leaves in place on steep slopes, so they can begin decomposing and recreating the woodland soil ecosystem. Some young researcher may want to look into this. I bet it would make a great graduate research project. The seeds are held long into winter and are eaten by Turkey, Grouse and various songbirds. There have been several snowy years when I’ve seen myriad bird tracks and wing marks in the snow around these stalks. In this section, the creek has a bit of a flood plain in which to meander. A limestone mass, just out of frame to the left, causes the water to make an abrupt turn towards the right bank. Healthy sized gravel bars have developed on the inside of the curves. Overland flow falling over the right bank leaves the soil saturated and more susceptible to erosion. The bank has moved over four feet in the last 20 years. There’s a deer highway on top of the bank that further accelerates the erosion. The combination of creek water rounding the curve, saturated soil on the bank, and deer damage on top of the bank makes it unlikely that this bank will stabilize anytime soon. The source of the water is about 100 feet from the creek bank. A large wet area has developed where the water slowly flows across the flood plain. I’ve thought that this area might display vegetation more typical of wet areas, but the seasonal wetness is strictly a winter phenomenon and doesn’t seem to significantly influence plant growth. Here’s the source of the water flow. Rain that fell on the neighboring hillside has completed its subterranean journey and is surfacing from these small holes. Disturbing the sediment helps trace the rate and direction of water movement. Above and to the right of the holes, rapid water movement quickly replaced the cloudy water with clear. Left of the hole is a quiet backwater that is taking a long time to clear. Below and right is slower moving water that still shows the streaks of sediment moving away toward the lower right side of the photo. This has been a record year for finding spent helium balloons littering Blue Jay Barrens. A festive orange balloon found the day after Christmas marked number seven for the year, two above the previous record. The fresh condition of the string indicates that it hasn’t been exposed to the elements for too long a time. A dozen feet to the side it could have fallen into an early trash repository. This looks like it was a one load dump. The idea that it is not only proper, but beneficial to deposit trash in gullies, is one that is still alive and well in today’s society. The presence of the old gas tank makes me wonder what contaminants may have found their way to this site. The old tub was probably still sound enough to hold some of the smaller objects going to the dump. I wonder what conditions initiated collection and removal of junk from around the homestead. Did these items form a growing pile outside the barn until a certain dumpable volume was reached? I think it more likely that everything was scattered about and only moved when it became an obstacle or nuisance. There are several small dumps with one roll each of old poultry fencing. I was told that the fence came from a time a couple of generations ago when the family was big into raising chickens and pheasants. When poultry raising activities were abandoned, the birds were all turned lose. Since the fence was supposedly all made obsolete at the same time, it’s odd that the discarded wire was dumped in so many different places. Maybe there was a recipe for dump loads that called for no more than one roll of wire per pile. When I saw a flash of blue from a distance, I thought I had found balloon number eight. It was actually a plastic grocery sack tied to a tree. Unless the wind has been doing some crazy things, this knot is hand tied. I presume it to be a marker intended to help a deer hunter find his way through the woods. If I had found him, I would have pointed out that he was a litterbug, a trespasser and a poacher. It’s funny when these guys argue that they’re not poachers. I always recommend they read the hunting regulations and note that a poacher is someone hunting on private property without written permission of the owner. Claiming that “The Guy” said it was OK isn’t quite good enough. This is the typical pond water level during the winter; with the water about 30 inches deep near the center. I was hoping the Christmas rains would bring out some salamanders, but the timing, amount and duration of rain was totally inadequate for the purpose. Jefferson’s and Small-mouthed salamanders are the most likely to make a late December appearance. Two sides of the pond are kept mowed, primarily to make it easier for me to get to the water to see what’s going on. From the time I first began to walk, I’ve been dabbling around the edges of ponds and I don’t see that habit being broken. Another habit I’ll probably never break is reaching out a little too far and ending up with some part of me in the water. The rest of the pond is left unmowed and contains a nice collection of shrubs and dead wood. Some bird species, like cardinals and sparrows, like to utilize the brushy part of the pond. Doves and waxwings only visit the open sides. The vegetation I mowed in August is decomposing and providing the nutrients necessary for a build up of daphnia and other crustaceans. These will be the first foods of the newly hatched salamander larvae. There’s also a light growth of algae that feeds a host of aquatic insect species. Most salamanders attach their egg clusters to short grass stalks near the center of the pond. Occasionally I’ll find an egg cluster on one of the shrub branches. The branches often become exposed when the water level drops, so I’ll remove the branch with the eggs and move it into deeper water. There are a few plants, such as this Common Alder, Alnus serrulata, that I added to the property before learning of the unique ecosystem I was dealing with here. The alders were planted the year after we bought the property and were obtained through a free shrub program managed by the ODNR Division of Wildlife. According to the wildlife management principles I was taught in school, planting shrubs in the corner of an old crop field was a wonderful thing to do. Now my management plan doesn’t allow the introduction of any plants or seeds from an off site source, even if they are Ohio natives. Common Alder has a lot of interesting features. Pollen is produced by these long, drooping catkins. This is one of those characteristics that is easily seen any time the shrub is in a leafless condition. Seeds are produced in these little cones. One of the reasons I planted alders was to have a supply of the cones. I thought they would be great for craft projects. Unfortunately, I’m not very crafty as far as producing art is concerned, so I don’t use many cones. Some would argue that I’m quite crafty, but they are referring to the use of trickery and subtle cunning in dealings with people. The Common Alders were planted at the base of a slope where the moisture level remains high. A couple die each year. I estimate that they’ll be gone in another five or ten years. The few alder seedlings that develop are eliminated as part of the maintenance program. If it weren’t for all the neat lichens that grow on their trunks, I would probably go ahead and cut down the alders. Some of my planned projects will result in drastic changes to the landscape. Water flows from many points on the left side of this photo and concentrates at a point to the right. Just out of frame on the right is my combination vegetable and native plant garden. Runoff water used to flow through the center of the garden site, but I built a low diversion to carry the water around the garden. The diversion works perfectly and I’m able to have a very productive garden without excess water or erosion. The diversion dike produced a short lived pool after each rain and the excess water flowed in this direction through a shallow channel. In preparation of one of my projects for next summer, I lowered the channel center line to eliminate the temporary pool. The project I have planned for this site is the result of several interrelated observations. The first is the fact that encounters with American Toads, both breeding individuals in the temporary pond in front of the house and individuals found in the fields and woods, have declined dramatically during the last 20 years. The second is the reduction in encounters with the Eastern Hognose Snake, a species that prefers toads over any other prey. If a population of Hognose Snakes is to be maintained here, there must be toads. The plan is to build series of temporary pools that will (I’m not giving the toads an option) be used for toad breeding in the spring. This site has several points in its favor for such a project. High up the slope are two wet weather springs that will act to keep the pools full for a few extra days between rains. The soils have a clay content high enough to slow seepage loss and maintain a pool during the wet time of the year. The higher moisture content of this site has helped to keep a thick sod of Fescue growing here, so I won’t be tearing up any native plants while building the pool. To maintain the temporary pool ecology, I will have to drain any water that remains into summer. This extra water can be used to irrigate the garden. The wet weather springs sometimes keep water in this old tire track well into June. I’ll begin my pool construction here with a small pool of 15 or 20 square feet that can be kept full by the springs. The pools in series will gradually increase in size with the last having about 750 square feet of surface area. Actual earthmoving won’t begin until June or July, but there are other preliminary activities that I’ll be doing later this winter and spring. Here is one the more scenic sections of creek at Blue Jay Barrens. That snow covered log lying on the bank was once part of a tree that fell and bridged the creek at this point. When the tree finally decomposed and fell, the flood waters put this section up on the bank and it hasn’t moved for several years. Although it’s a short drop, waterfall music abounds here. This is perfect for people who are soothed by the sound of moving water. Small in size, but big in sound, the gurgles, splashes and bloops of the little falls make it a bad location if your aim is to enjoy the sound of nature in the woods. Fast moving water keeps any silt from settling here. The clean rock bottom makes an ideal location for streamlined mayfly nymphs that graze algae from the rocks in fast moving water. The fractured limestone bedrock has created a series of uneven stair steps. In the spring, tiny Northern Creek Chubs and Blacknose Daces stage in the pool and make leaps and runs to clear the falls. It’s like having a miniature model of a salmon run. The unique geology of the area is responsible for the characteristics of this waterfall. The gradual left to right tilt of the bedrock shelf guides the water to the right, where a section of bedrock has fallen away. A strong downward slant in the bedrock towards the upstream direction has created an upthrust that effectively stops the water from flowing straight downstream. This big slab of rock seems to be quite stable, so I’m hoping the waterfall will be a long term feature at Blue Jay Barrens. I like to take advantage of opportunities that allow me to see the prairies in a slightly different format. The Mound Builder Ants are an integral part of the prairie ecosystem and I love to watch as they interact with the rest of the prairie components. It’s hard to get a feel for the numbers of mounds that are hidden in the fields of tall grass. The recent snow has turned each snow capped mound into a shining beacon. In its normal condition, this mound would have been perfectly camouflaged. Now it reveals its presence and makes me wonder what the tens of thousands of communal lives are doing beneath the icy cap. Speaking of thousands, one of the items on my list of things to do is to construct an ant farm large enough to house one of these colonies. I’m not sure my wife would want me keeping it in the house. Bare earth still holds enough warmth to melt snow, but the elevated mounds cool more quickly and are able to maintain the snow cover. I suppose the mounds tend to moderate the rate at which temperatures change below. This would give chilly ants an advantage if they had to retreat from dangerously low temperatures. The mounds look to me like the dorsal fins of a school of hungry grass sharks. A solid snow cover will reflect the sun’s heat for a long time before beginning to melt. Once the dark soil of the mound is exposed, the remaining snow quickly disappears. When I first saw these mounds I thought the steeper looking right side was just an illusion attributed to the fact that the left side had to extend down slope. Measurements revealed that the right side actually was steeper than the left. Besides traveling in the direction of the ground slope, the left side faces the prevailing wind. Is the wind strong enough here to influence the shape of the mound, or is this design that of the ants. Yet another riddle for me to solve. Clearing cedars from the prairie and barren openings generally resulted in an abrupt change from open sunny conditions to dark shade. Since my initial goal was to bring sunlight to those areas in the greatest need, I stopped cutting at the point where the fields began to change to woods. The change from one habitat type was as abrupt as going through a doorway into another room. The grasses thrived in the increased light and the woods continued pretty much as before. As a strategy for improving conditions for grassland species, my methods were successful. I failed, however, to provide for those plants that thrive in the transitional zones between full sun and full shade. That group of plants includes some of the rarities found here, so it becomes a priority for me to provide a more gradual transition so as to host a broader range of plant species. Increasing plant diversity should then result in a more diverse animal population. Think tiny animals. Most of the work to gradualize (I sometimes make up words) the transition between areas will involve removal of more cedars in and along the woodland edge. Following this, removal of some deciduous branches may be needed. The woods will still maintain an almost closed canopy. Most of the light entering the transitional zone during the summer will come from low angle sunlight or reflection from the open field. Work on transition zones will be a part of my updated 2011-2015 management plan. Before doing any cutting, I’ll have to go through and inventory existing conditions. In order to evaluate any type of management work, it’s essential that you know as much as possible about conditions existing prior to manipulation. You can’t monitor change if you don’t know where you started. The combination of wind, rain, wind, snow and wind has resulted in the loss of leaves from most of the unsheltered oaks. Normally during this time of year, you can see the oaks still holding a large percentage of their leaves. Cedars partially protected this oak, but the top was exposed to the wind. These leaves are still hanging tight and it takes a pretty good tug to make them come loose. I don’t know where the benefit lies in keeping the dead leaves on the tree. The big cedar on the left blocked some of the wind from the neighboring oak, but the wind managed to nearly denude the upper half of the tree. I know a person that does winter tree identification by picking up a leaf from beneath the tree. I failed to convince him of the absurdity of the idea that tree leaves fell straight down. He couldn’t quite get my point. This little tree has suffered several setbacks through the years. The wind has removed the burden of having to maintain any growth on the mostly dead tree. Maybe the roots are healthy enough to send up a strong, new shoot. This section of the woods is primarily oaks. Strong west winds, going from left to right through this shot, have taken most of the leaves except for a small patch on the right side. This may benefit some of the early spring wildflowers that end up wearing a cap of spring falling oak leaves.